I'm sitting here, calendar in hand, camping directories on another page. This year, my husband can't take off more than a couple days at a time, so we won't be visiting relatives far away. We're creating some 3-day-weekend adventures instead. Those hidden fishing spots rarely come with a decent motel. (And by decent, I mean "no one cooking meth in the room next door.") So I'll be challenging myself to camp frugally...and enjoy it! Karla accepts that kids will get wet and dirty, then lets them. Amy kicks off her Manolos but brings the Pack N Play. Mary Ellen says outdoor time has an ultimate purpose. I somehow had the impression that you do not enjoy camping. It does seems it would be hard with a 6-month-old baby. Camping would not be a vacation for me personally but I do think several mini vacations are sometimes better than one long one. I hope everyone has fun! You made me laugh with the "cooking meth" comment...isn't that just a sad state of affairs? Sad, sad. But the tent sure looks fun! The first time we took our boys camping they were 4 and 2. We got there late...ate muffins and pickles for dinner as we set up the tent by headlight...my husband and I were SO frustrated...meanwhile the boys sat in folding chairs mesmerized by the stars. We finally got the tent set up and sleeping bags on the ground...and as I'm tucking my sweet boys into bed my then 4 year old put his hands behind his head....let out a long sigh...and said, "Mom, this is the life." We love camping. We have found that once you have a few good quality items, camping can be quite cheap! Since we have to eat anyway :o) the camp site fee and propane for our tailgater grill is just about the only cost involved. If you are willing to do primitive camping, there are quite a few websites that list free camp sites. (Many have vault toilets, but no electricity.) Even if primitive camping isn't your thing, most camp grounds are under $20 a night. Ya'll should SO come camp down here! Crockett Park is so serene and fun...lots to do and just a short drive away. I think a camping spot is like $10 a night, so cheap, cheap! Maybe I could cook dinner for ya'll one night in my newly improved kitchen. for some tips and ideas on camping with kids. You may already know some of these, but either way, I hope it helps. Have fun! We are passing down the tradition of camping that I grew up with to our kids. This year they will be aged 6 and 4. I love it. BUT, I appreciate my mom more than ever in my life during the prep and unpack. She camped with 3 young kids less than 3 years apart! When my parents upgraded from the tent to the pop-up tent camper we camped for 2-4 WEEKS at a time. (They were both school teachers! )During my childhood they showed us the Rocky Mountains, Yellowstone, and the Hudson Bay. Not bad for a family living on the east coast. We haven't been camping together as a whole family in a year or two; and, though I'm not the outdoorsy type, I'm actually craving a camping trip. There is something simple and serene about it, isn't there? We have yet to try camping - mainly due to my extreme fear of snakes:) My girlfriend camps with her family several times each year - they even took their new baby when she was five weeks old! It sounds like a great way to squeeze in several mini-vacations this summer! Also, a small note book for Andrew to write down all of the things he finds. Save a few leaves etc. Enjoy your travels wherever they may be! What memories we have of trips like this with our children! My husband and I had our last ever tent camping trip 3 summers ago- I decided that at 50 I would no longer wake up with a sore back but oh the laughs I have just remembering our last trip with just the two of us- camping on the beach in near tornado force winds with my husband on a cell call from work and trying to hold onto the tent for dear life. All I could do was laugh uncontrollably! Joan, you know I do not enjoy camping. That is why I'm writing about challenging myself to learn to enjoy it, as it is a reality for this summer. We love to camp! My just-turned-four-year-old begged to go camping all winter long and now tonight is the night! We took him camping for the first time when he was two months old AND that was the night he slept through the night for the first time! In college my husband (he wasn't then) and I and a bunch of friends would go backpacking every Martin Luther King Junior Day weekend. Hike in with everything on your back. Set up camp wherever you please. But no fires allowed in the wilderness area (in January). Oh yes, we live in SD where temps were often around zero. Strangely enough, we loved it! Now we aim for three to five long weekend camping trips (at a campground with toilets) each summer. (Three kids four and under. )We'll see how the new two-month-old handles it this year! Oh how I dislike camping! I also dislike meth labs next door! I much prefer activities at home, or taking day trips and then sleeping in my own bed when night comes. Special food and a break from daily routine with special activites makes staying home like a vacation. I gather camping is not your vacation of choice. As a child, my family did not camp. Really, we didn't recreate (we were farmers & ranchers so there was always a reason why we couldn't be gone). My husbands family, well different story. So for years he was set on getting us camping. I told him when we didn't have children in diapers I would be willing to go. So, let me say that I think you're a brave woman taking an infant camping! That first camping trip was years ago and it has now become an annual ritual; one that our girls look forward to. Our first trip for this season is scheduled for Memorial day weekend with 2 other families. Many memories to be made. Enjoy! It's always fun when we get there but the prep work....oh my. Ohhh I can't read about this! A good friend and I are taking two three-year-olds and two six-year-olds tent camping in June for the first time. Six-year-old has been begging forever! I haven't been since I was six. Kind of excited and terrified of the tics all at the same time. Oh I love camping! We have never tried it with kids though - our first will arrive this summer, so we'll see! :-) We love to go to places nearby and we have learned *so* much about our state that we never knew. There are probably loads of places in Tennessee that are good! (We live in Georgia.) Camping is fairly inexpensive and a lot of fun, and I think it's important for kids to spend time in the outdoors. :-) I hope you make some wonderful memories this summer!! I have wonderful memeories of many different kinds of vacations growing up. We stayed in cabins on lakes in Wisconsin that were pretty cheap, nice resorts, hotels, did tent camping, did camping with a pop-up....my mom loved to travel (and still does, even at 67!) and we did everything growing up. As a result, I have many, many wonderful memories that very much shaped who I became as an adult. So I think it will be a good experience for all of you, and hopefully everyone will come away with good memories! And, too, you probably won't have to camp if you don't want to for every vacation, so that helps keep this one from being overwhelming! My mom was GREAT at finding great bargains so that we could do tons of traveling growing up. My youngest is 2 years old right now, and several of the older kids REALLY want to go camping this summer....but the thought of it just completely stresses me out. I think it's the idea of chasing Olivia and keeping her safe around all the campfires and just general stuff that really stresses me! She's just about impossible sometimes at home, so I can't imagine camping with her! (Oh, but she is a precious, sweet little girl...just very, very busy!!) At this point in my life, camping doesn't sound very relaxing. Anyway, I think I just need to quit feeling sorry for myself and make the attempt to go camping, too, just like you guys are, so that the kids can have a fun and memorable experience!! (And one that is within our budget this year! The oldest starts college in the fall!!) And trust me, these are the kinds of experiences that your family will talk about for the next 30 years! We still tease my dad about getting altitude sickness in the campground in Colorado and hearing him throwing up in the camp bathroom, and it echoed ALL through the campground...you could hear it a mile away! I'm laughing as I write this....my poor dad! No one ever has forgotten, and we still laugh about it all these years later!! Anyway, have a WONDERFUL time! The experience will be worth the hassle! I just typed up a nice long list of tips for you, and it is now lost. Well, I'll recap briefly what I remember. 1. If you have electricity, cook with a crockpot. Bring pre-prepared and frozen meals that you can easily toss into the crockpot. Or, bring pre-prepared ingredients (like already-cooked meat) with some canned convenience items (cream soups, milk, etc.) to quickly stir up a crockpot meal. 2. Bring a space heater for your tent, if you think it might be cold at night. 3. Sleep on a cot or cushion or air mattress or something more comfortable than a sleeping bag on the hard ground. 4. Bring a chair that you will enjoy sitting in. Sitting on picnic benches, sleeping bags, and uncomfortable folding chairs for three days is wearisome, especially while holding a baby. 5. Bring bottles of frozen drinking water. Use these as your coolant in your coolers. As they thaw, take them out and drink them. Good drinking water is not to be sneezed at while camping. 6. Do as much prep work as possible at home for your meals. Anything that can be chopped, cooked, formed, measured, mixed, etc., be sure to do it. It's much easier and cleaner to do this work in your own kitchen, than at a picnic table in the rain, with a bucket of water to wash your hands in. The more little details I have to handle while camping, the more my stress level rises. 7. Use disposable whenever your budget will allow: plates, bowls, plasticware, etc. 8. Discuss in advance when and how your children will help you while camping. This alleviates stress, and reminds them that vacation for the family does not mean a vacation for everyone except Mom. 9. Bring some sort of a fold up table for meal prep. Being able to keep the propane burner, pots, etc. on a separate table from the picnic table made life easier. 10. Enjoy! You're at least halfway there with your excellent attitude. A weekend camping trip is just about right when you have little ones! Just don't try to be a purist--meaning it's okay to bring a fan. Make sure your site has water and electricity. Pizza is totally appropriate camp food, especially when fires are a big pain in the neck. Freeze bottles of water instead of having loose ice in the cooler. The food will be much more appetizing if it hasn't been swimming. Prepare your little one for the morning invasion of Daddy-Long-Legs. Every morning, we woke up with at least 10 of them between the tent and the fly. Make a game of trying to count them and show the little ones how you zip the tent up tight at night to keep them out. And don't be afraid to take a walk around the campground. You might just strike up a conversation with someone who can be a lifelong friend. Happened to my son. We met with his family every year around the same time in nearby campgrounds. Have fun! Just wanted to let you know I linked to this on my weekly link roundup. We're looking at taking the 2-year-old-terrible-sleeper camping for the first time in a few weeks. I think it will be fun, but camping is really out of my element. It'll be fun, though, I'm sure. We plan to camp out in our big backyard this weekend. 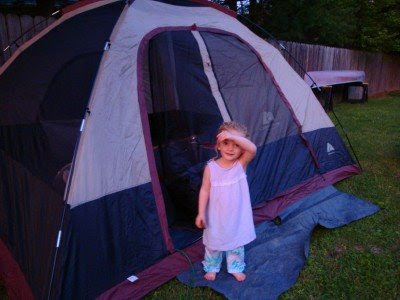 We usually camp in a rustic cabin but our 4 year old wants to try out tent camping. I'm skeptical so we will stick close to home. We have our fire pit all ready to go, smores makings in the pantry, and there are some new fishing spots we hope to try a couple of towns away. TN has some great state parks. Look for the book Tent Camping in TN. There's even one campground along the Natchez Trace that's free! I also recommend you try Tims Ford State Park. It's only about 2 hrs from Nashville. Easy tent camping. Nice playground in the campground. Close, clean bathrooms. Pool. Ice Cream. Paved trails circle the campground for easy walks. Bring extra bread for the deer. Have Fun! Thanks for the link! You'll have a great time!